Farmgirl Fare: Menu For Hope 4: Would You Like APhone Call From A Foodie Farmgirl? Phone Call From A Foodie Farmgirl? Once again it's time for Menu For Hope, the annual fundraiser created by food blogger Pim Techamuanvivit to raise money for a worthwhile, food-related cause. Last year we raised a whopping $63,925 for the UN World Food Programme, the world’s largest food aid agency, which works with over 1,000 other organizations in over 80 countries. In addition to providing food, the World Food Program helps hungry people become self-reliant so they escape hunger for good. This year we'll be working with the WFP again, and the donated funds from Menu For Hope will be specifically earmarked for a school lunch program in Lesotho, Africa. Instead of shipping surplus corn across the ocean, the WFP is buying directly from local subsistent farmers who practice conservation farming methods in Lesotho to feed the children there--and help keep them in school so that they learn the skills to feed themselves in the future. How does Menu For Hope work? Food bloggers from all over the world join the campaign by offering a delectable array of prizes for the Menu for Hope raffle--you can read about all the prizes here. Once again there are some truly amazing donations. See below for how to buy your virtual raffle tickets. A Phone Call From A Foodie Farmgirl! Thinking about moving to the country? Have questions about living on a farm? Wondering if you're crazy enough to trade your civilized existence for days spent wearing overalls, carrying a pitchfork, and hanging out down at the feed store? Well here's a chance to have your questions answered. On the day of your choice, I'll call you and we'll chat for half an hour about whatever you like: country life, organic gardening, cooking and food, bread baking, raising sheep, putting up hay, starting a bakery, starting a blog, living 140 miles from the nearest mall and 30 miles from cell phone reception, the best place to buy rubber boots, how to process and vacuum seal a deer. . . I'll don't know if I'll be able to answer all of your questions, but I can definitely guarantee there will be laughing involved. Unless of course you want to be really serious. Wait, strike that. I'm not capable of talking on the phone without laughing hysterically at some point. In any case, I'm looking forward to talking with you! Note: This prize is limited to phone numbers within the U.S., but if you're in another country and are interested, I'd be happy to do a live chat online with you via gmail. I realize it's not the same thing as a phone call, but I figured I'd toss the option out there just in case. We can chat for longer than a half hour, and I do type very fast! The prize code for the Phone Call From A Foodie Farmgirl is UC11. Because I hope you'll also consider making a much needed donation to one of my favorite pet charities, I'm going to entice you by holding my own separate mini raffle for a second foodie farmgirl phone call. Your tax-deductible donations will go directly to A Place To Bark. . .And Meow, the non-profit animal rescue run by the truly incredible Bernie Berlin. (This year alone she saved 500 abused and abandoned dogs and cats from certain death.) I talked to Bernie about my raffle idea the other day and she's really excited about it, as am I. I'll post more details in the next few days. 1. 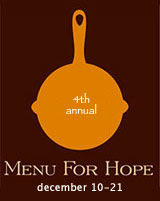 Choose a prize or prizes of your choice from our Menu for Hope at Chez Pim. Prizes from the Central U.S. region are also highlighted at Kalyn's Kitchen. 5. Please check the box to allow us to see your email address so that we can contact you if you win.Your email address will not be shared with anyone. Check back on Chez Pim on Wednesday, January 9th for the results of the raffles. Oh do bid on this prize! As someone who manages halfway regular phone calls with Farmgirl (what, she has a real name?) I can tell you that the conversation will be easy, wide-ranging, and yes, full of laughs! Thanks for coming up with such an interesting prize! I'm really hoping we can break the record again this year! BTW, I see the options are all there below so it fixed itself! Hooray! i think this prize is a big deal. Do you have skype? That is such an awesome prize! great idea! I have a feeling we're going to break last years whopping record. These prizes are truly staggering. And so many of them! Thanks for all the work you're doing as our regional coordinator. You did such a great job last year, too. Great to hear from you. I've missed our correspondence. No, sorry, no skype. Well isn't is Ms. Garlic Breath herself? ; ) Always nice to hear from you--and thanks! Wow. I can't help but think that this is one of the most thoughtful gifts out there. While getting stuff, especially foodie stuff, is always nice, it's so wonderful of you to be able to reach out and offer a bit of yourself and your time. And yeah, you're not kidding about donkeys. When I lived in France, I woke up to one every day... and often in the middle of the night.